My daughter received the most beautiful dress for her first birthday. I loved it, particularly the fabric. Unfortunately, it was way too big, and by the time the next Summer rolled around she was too tall for it. Since then it's been sitting in her cupboard, as I loved it too much to throw out. 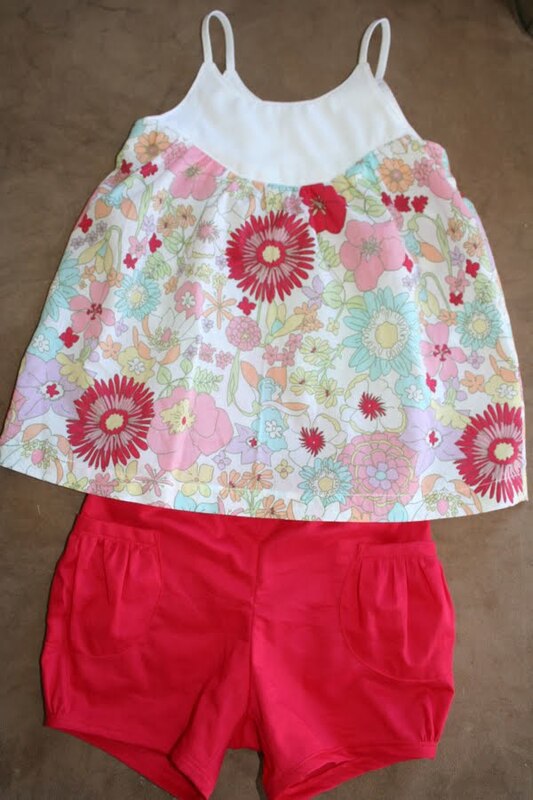 It's been waiting for daughter #2 to show up, but there's every chance I won't have another daughter, so last weekend I decided to cut the dress up and put the fabric to good use as a new top for my little girl. 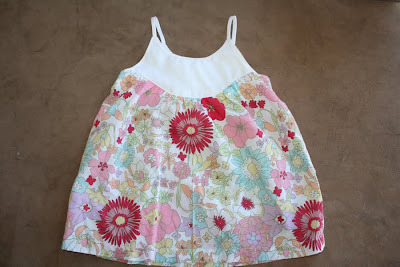 I've wanted to make Oliver + S's Swingset tunic for a while. I love the structured look of the bodice compared to the floaty main panel. I used the recycled fabric for the main panel. It's printed floral voile and so sweet. 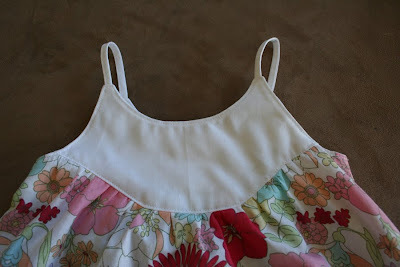 I used a plain white quilter's cotton for the bodice. I also *finally* got around to making some puppet show shorts too. 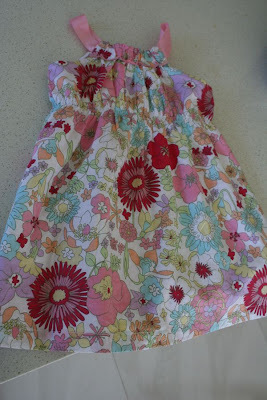 I have long admired these and am really pleased with how they look and how easy they were to sew. I wanted them to match the Swingset tunic, so used the same deep raspberry colour that's in the top, to make the shorts. 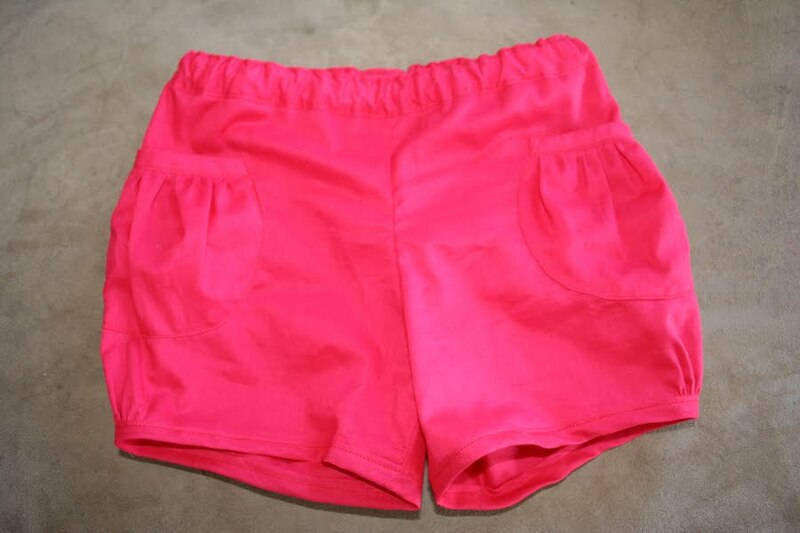 The shorts are made of voile, which is super sheer. I ended up using a double layer of the voile for the main part of the shorts (so no-one has to be subjected to my little one's Dora knickers!) with a single layer for the pockets, waist and binding. I really, really recommend these shorts. They look so cute on and are quick to make. A few hours of unpicking and sewing later, turned into this. Hurrah! 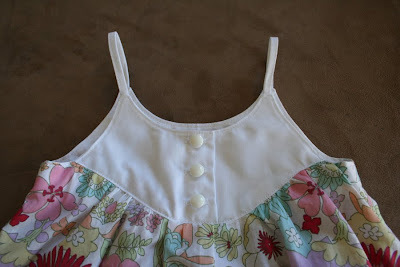 The back is buttoned with three white, glossy plastic buttons. The finished shorts. The colour is washed out here, it's a deep, almost red, raspberry colour. 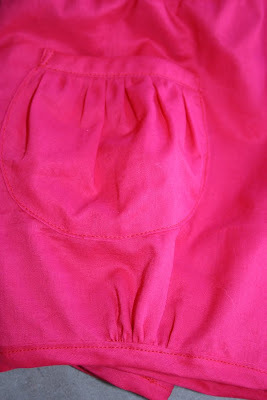 The shorts have a cute gathered pocket, and gathers at the cuff, which make them bloomer-ish. Love the outfit! Fabulous way to make use of the dress. That is sooo cool. My daughter has the same dress too but we have a little one who will wear it one day. What a great job you've shared though and I love Oliver + S patterns. What a great idea - I've thought about re-using some fabric from dresses that I've made. I hope I can make it work!